My birthday is always around Mother’s Day. In fact, whenever I talk to my mom on either day (whichever happens to come first) she never fails to mention she brought me home from the hospital on Mother’s Day. Some years my birthday actually falls on the holiday and that’s what happened this year. Even though both events were on a single day, the whole weekend had a relaxed but celebratory feel. 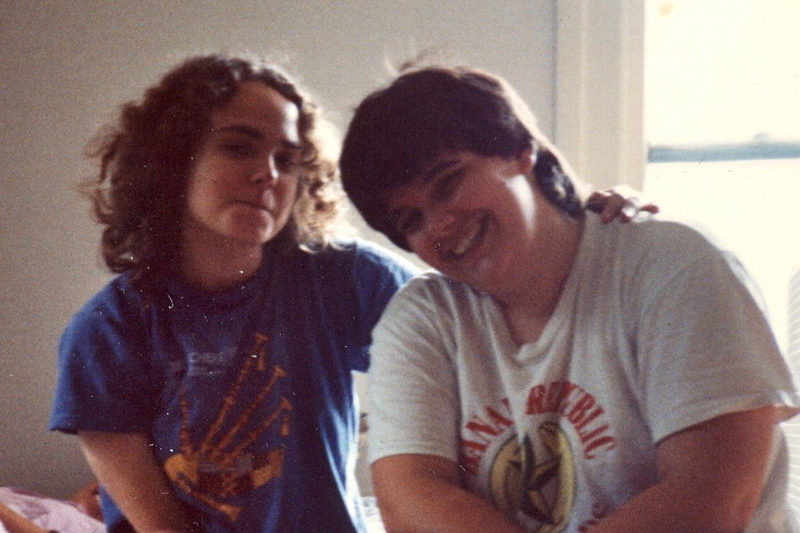 Before Beth got home, June and I scrubbed the grime off a couple fans because hot weather was predicted the following week and then we drank iced tea and played a board game of her own invention, plus two card games (Rat-a-Tat Cat and Sleeping Queens, both favorites of hers). I suggested we watch Tangled or Brave, because she had not seen either of them and I am getting tired of Tinkerbell movies, even though they’re really not as horrible as you might think. I thought she’d go for Brave, but she said, “Tangled!” immediately and so when Beth came home, bearing pizza, she set it to download while we ate. June got herself a raspberry-lemon popsicle from the freezer and we settled on the couch to watch the movie. When the backstory of how Rapunzel ended up locked away from the world in her tower was established, I said to Beth, “Didn’t we just see this movie?” Beth later concluded Frozen was better, but Tangled was entertaining enough. Ironically, I’d suggested Brave and Tangled largely because I thought Noah wouldn’t mind missing them, but guess what movie they showed on the bus on the way home from Hershey? That’s right. It was Tangled. What are the chances? We put June to bed at 8:30 and Beth didn’t need to leave to get Noah until 10:00. She had a long phone conversation with her brother, but even so that left us with forty-five minutes just to hang out and talk, which felt luxurious. Noah’s bedtime is so close to ours that we’re rarely alone together in the house for any extended period of time. It’s that kind of thing that reminds me we need to be more proactive about carving out time to spend together. Saturday Beth took June to Kung Fu and ran errands and Noah did homework and I did some chores around the house and started a project of collecting photos of my mom, Beth, and Beth’s mom for a set of Mother’s Day albums I would post on Facebook the next day. We were planning an early birthday dinner at the Vegetable Garden, a vegan Chinese restaurant, because we wanted to avoid the Mother’s Day restaurant crush. It’s a bit of a hike from Takoma, so we were intending to leave around five, but we were delayed over an hour by a flat tire. I almost gave up on the idea of going, because while I’m getting more flexible about bedtime, two nights in a row is pushing it for me. But Beth gently nudged me into going, and we did. I was glad of it as soon as the crispy black mushroom appetizer arrived because it is really, really good. We also got spring rolls, hot and sour soup, dumplings, a noodle dish, and a couple of vegetable-with-fake-meat dishes (my favorite was the “chicken” with asparagus). I just finished the leftovers for lunch today. The first notable thing about Sunday was that I slept in until 8:20. It’s rare for me to sleep past seven on a weekend and I’m usually awake earlier than that. The kids get up early (even the teenager) and though they are pretty self-sufficient about breakfast and entertaining themselves, they are not as quiet as I’d like, plus it’s a small house, and I’m a light sleeper, so there you go. I’d had trouble sleeping the night before, though, so I guess I really needed the extra sleep and it was enough so that I felt reasonably well rested when I woke. We exchanged a great many gifts: Mother’s Day presents for Beth and me from the kids, and birthday presents for me. Beth got a David Sedaris book from Noah and a big candle from June. I got fancy orange marmalade and a brownie from Noah, salted caramel-flavored sugar crystals and a bottle of shells and sand and shells glued to some driftwood from June. I also got a few books, two mysteries and Joyce Carol Oates’ Accursed, from my mom and Noah. Beth gave me a gift certificate for the American Film Institute, (our favorite date destination), another gift certificate for a Takoma coffee shop, and–best of all–the promise of a mid-week getaway to Rehoboth some time this summer. (We won’t be spending our usual week at the beach this summer, because we are going to Oregon to visit my mom, stepfather, sister and other relatives.) Books, coffee, time with Beth, and time at the beach is pretty much all I want out of life sometimes. I continued to gather and post photos while Beth and June went grocery shopping and Noah read A Midsummer’s Night’s Dream. In the afternoon Beth went to her MOOCs on capitalism and Andy Warhol. While she was gone June and I toured the house next door, which after being vacant at least fifteen years and then undergoing a gutting and renovation that lasted about a year is finally for sale. The realtor noted somewhat wearily that a lot of people at the open house were not potential buyers but curious neighbors like us. Because the house next door is three stories and ours is just one, we got to look out the windows at our own roof, which June found quite amusing. She’s hoping a family with kids moves in and soon. Beth is not looking forward to having to share the driveway with neighbors, but it has to be better than sharing it with contractors’ vehicles and dumpsters, one of which clipped our eaves and did $800 worth of damage last summer. A side note: For those of you who don’t know the story of our cat Xander’s adventure in the basement of this house, I recommend this post—it’s a good one, with a surprise ending: “Xander in the House” (3/2/13). Later I went for a swim and came home to the smell of lasagna baking. I’d requested spinach lasagna, garlic bread, and a salad with Romaine lettuce for dinner and that’s just what Beth made, along with a vanilla birthday cake with lemon frosting served with strawberry ice cream, also at my request. Everything was delicious. 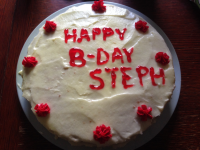 I very much appreciate everything Beth did to make my birthday special. The weekend was especially nice because it came on the heels of a week in which I’d been sick, and after several weeks of high stress at work for Beth and my feeling kind of lost and sad. There were a couple little things that cheered me during this time, though. My friend Megan very sweetly brought me a latte once day when June was home sick and I was complaining on Facebook that I couldn’t get out of the house to buy myself one. Then I met an old friend from college who was passing through the DC area briefly. While we were catching up I told him about the online courses Beth is taking and about my book club, which was reading the Iliad at the time (we’ve since moved on to Thomas Pyncheon). Because Jim met us when Beth was a philosophy major and I was a comparative literature major–I was reading the Aeneid in Latin one semester when he and I lived together– he was clearly delighted we were proving to be so true to type even at the ripe old age of forty-seven. As for Jim, he was math major, always very interested in computers, and he now works for Square, a company that runs a credit card payment app. I guess underneath all the trappings of motherhood and middle age, the twenty year olds we once were are still in there somewhere. 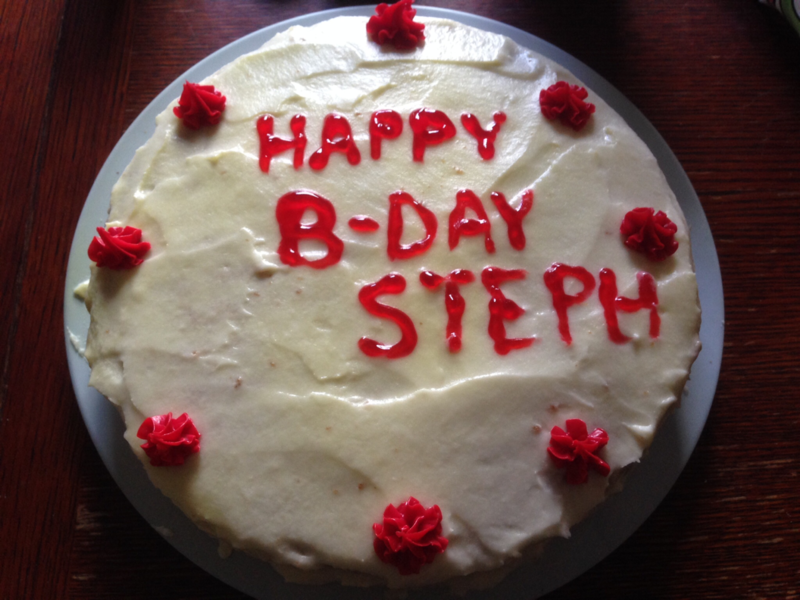 This entry was posted in Anniversaries, Birthdays and Half-Birthdays, Flashbacks, Friends, Holidays by Steph. Bookmark the permalink.